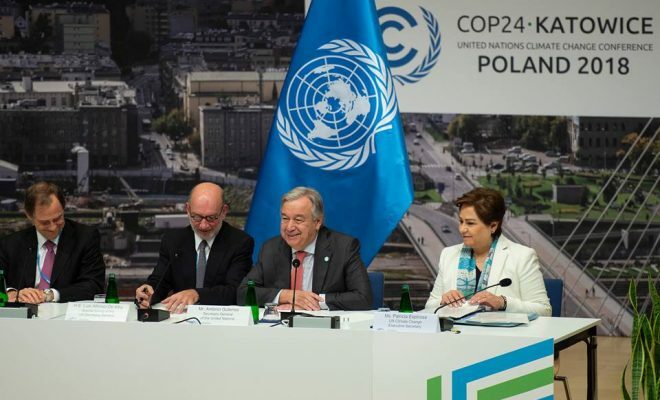 At discussions in Katowice, Poland, almost 200 countries will try to agree the Paris Agreement ‘rulebook’ That should lay out how countries will enact the accord, for example how they report their efforts to fight climate change. But as talks began on Sunday, thousands of points of disagreement remained. A hard divide between developed and developing nations would allow China, India, other major polluters, and many middle-income countries to slip into a category where the Paris Agreement has softer requirements. That will be resisted by the U.S. administration under Donald Trump. But yoking China to the same climate regime as the U.S. has been a bipartisan policy in Washington for decades. Therefore, it could also be unacceptable to a future Democratic president, according to Biniaz and Stern, who have left the U.S. government and are now working in Washington, DC think tanks, but continue to participate informally at UN talks. “I think that if the balance were off—like it went backwards on issues of differentiation—that future administrations might look at that and say ‘that’s not really something we want to be a part of’,” she said. Manuel Pulgar Vidal, who was the president of the 2014 Lima climate talks and is now climate lead at WWF, said trying to predict the U.S. position under a future president was inadvisable. “If we are going to take decisions based on the political context, we could fail,” he said. The binary option can be seen throughout the hundreds of pages presented to diplomats before the talks. For example, the section on transparent reporting of emissions cuts contains three options: common rules, partially different rules, and completely separate sets of guidelines for rich and poor. The issue is likely to result in significant tensions between the U.S. and Chinese delegations at the talks in Katowice. A state department spokesperson said that although the Trump administration expected to withdraw from the deal in 2020, it continued to participate in discussions to “ensure a level playing field”. In November, a U.S. state department team travelled to Beijing to try and find common ground ahead of the talks. China will be represented in Katowice by its longtime climate lead and former minister Xie Zhenhua. The U.S. delegation will be led by Judith Garber, a deputy assistant secretary, three rungs below ministerial level. Li said Xie’s efforts to move forward on political questions had been “frustrated” by the Trump administration’s lack of a political lead on climate change. Stern, who since he left the government has held informal meetings with Xie, said there was a danger of the talks going off track because the U.S. was “not engaged at a political level”. “It’s not like there are other people at a senior level expressing the kind of views that I would want to get across, because that’s not the case. So yes, I decided to get more involved myself, but for the sake of the agreement, not on behalf of the United States,” he said.